Wheel chocks are wedges made from various sturdy material, including wood placed behind the wheels of the plane so that any accidental movement can be prevented. New View Oklahoma is a private non-profit organization providing employment and rehabilitation for blind and visually impaired people. Founded in 1949, New View Oklahoma has been serving the community in a 156,000-square feet, five-floor manufacturing facility in Oklahoma City. Their products cover a wide range, including waste recycling, manufacturing fire hoses, vinyl shower curtains, disposable restroom mats and aircraft wheel chocks. This fact sheet summarizes influence of storage and moisture control on dimensional stability of wheel chocks. New View Oklahoma has been manufacturing wooden airplane wheels chocks for the U.S. military for almost 30 years. In Oklahoma, they are the only one producing chocks from wood. 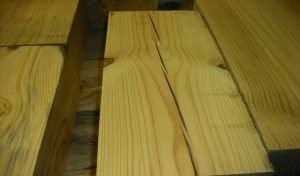 They receive 15-feet long Southern pine planks with a 6-inch by 6-inch cross section as raw material for their production. 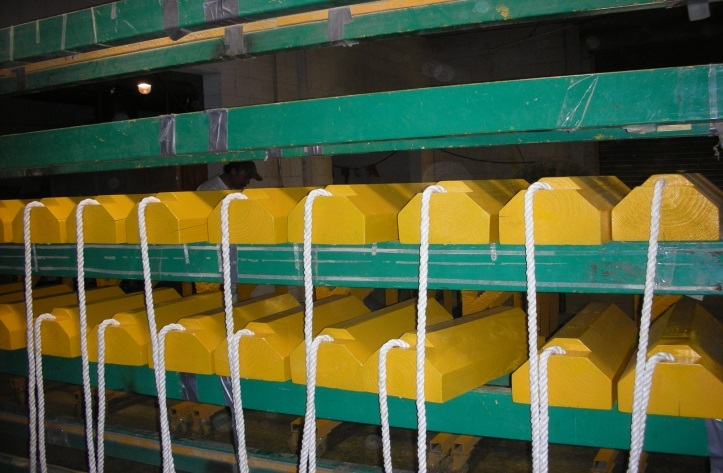 Planks are initially planned cut into shorter segment, drilled for ropes, painted and finally assembled in pairs prior the shipping. Figure 1 illustrates typical finished product. Recently, it was found that stored planks had some cracking and minor splitting problems before they were finished during the storage. It is a well-known fact that wood is hygroscopic material gaining and losing moisture content from the surrounding environment resulting in its dimensional changes. 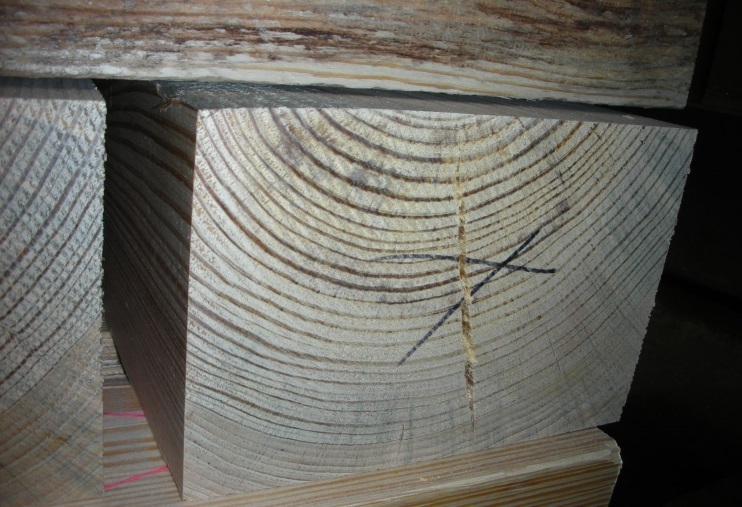 Such problem can result in cracking and splitting of wood, which is usually related to inadequate air circulation and moisture content control of the material after they are received as illustrated in Figures 2 and 3. Figure 3. A deep crack on the cross-section. 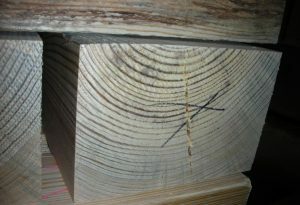 Random thin sections were cut from the stored planks to determine moisture content so that certain suggestions can be made to solve this problem. Thin sections were further cut into smaller pieces, weighed at an accuracy of 0.01 g on a laboratory scale and kept in an oven with a temperature of 103 degrees Celsius for two days to determine their oven-dry weights. Moisture content was calculated based on the following equation and expressed as percent. Table 1 displays the moisture content of the samples. Table 1. Moisture content values of the samples. Average moisture content of the samples was determined to be 20.5 percent, which is quite high for indoor storage of the planks without having any stickers. It’s suggested that the planks should be stored similar to typical air drying of lumber stacking by using 0.75-inch thick stickers between each piece so that ample air circulation can be applied to the surface of the planks to dry them more uniformly. Based on discussions with the technical members of the company, planks will possibly be stored in a large warehouse equipped with fans to move the moist air from the surface of the wood faster to prevent any possible cracking problems prior to further manufacturing steps. 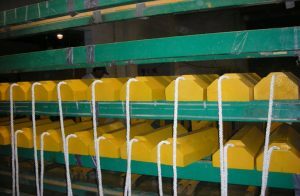 Lean manufacturing concept was recently introduced to the manufacturing process of the company, resulting in substantial travel-time reduction of the wood chocks throughout the production line. It is expected that once the above moisture control of the raw material suggestions are combined with the lean manufacturing approach, overall production line will not only be more efficient but also more defect free.